I’m back with Uncharted 4 Part 4! I posted part 3 not very long ago and if you read my post or watched the video, you would have seen Nathan underwater, at his house with his wife Elena, and stunned by the return of his brother whom he thought was killed. What a whirlwind of events to see in my first go round of Uncharted 4! Well now I will continue where I left off where Sam was discussing with Nathan that he’s in some trouble all thanks to a drug lord he was cell mates with in the Panamanian prison. 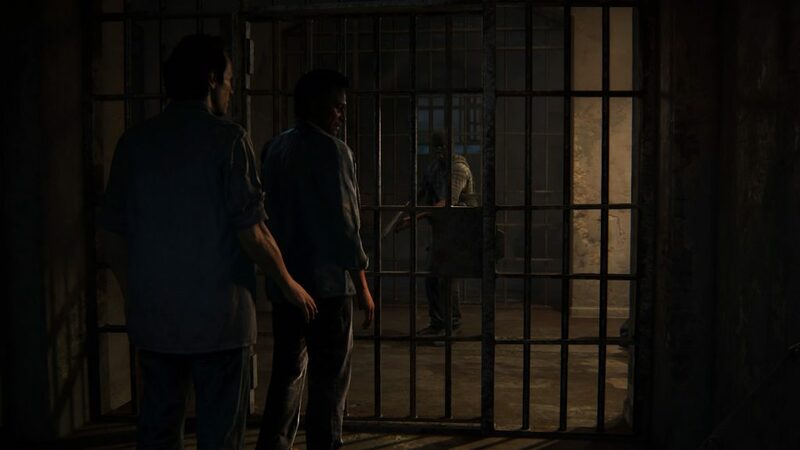 The prison is where the next chapter takes place as you see Sam doing some situps as this apparent drug lord enters the cell. They start making some small talk with the drug lord saying how content the guards are with their pathetic lives and then he asks Sam what he would do once he gets out of prison. He mentions that he would go search for that lost pirate ship that is said to have hundreds of millions of dollars worth of treasure on it. The drug lord talks about this as well and then all of a sudden you hear distant gunfire. The next thing you know is that you see masked gunmen with heavy artillery so to speak walk up to the cell and open it. They are the drug lords henchmen and they’ve come to get him out. Oh and I keep saying the drug lord, but his name is Hector Alcazar. As soon as the cell door is opened, Hector tells you to come with him. It is then that I suddenly gain control of Samuel Drake, head out of the cell and follow Hector and his gunmen. They head down stairs and past an area where there were guards stationed, but they’ve all been shot dead. Sam seems surprised by this because of what he says (you can see hear it in the video below). I continue to follow Hector until we come basically to what is a control room and then Alcazar grabs a gun from a guard lying on the floor and shoots him and Alcazar mentions they are doing the world a favor. The next thing that happens is that he hands Sam the guard’s gun and asks him if remembers how to use it. Hector then mentions something to one of his gunmen in the control room and then Sam tells Hector that if he does what he ordered his gunmen to do, he’ll start a prison riot. Hector responds by saying “Exactly”! As you can see this was all planned for quite awhile. Can’t say I’m necessarily surprised at that after all you don’t think that the biggest drug kingpin in all of Panama would let himself stay locked up in prison. His gunman hits a button and then an alarm sounds and Hector says for you to get ready as you wait by a door to open. As soon as the door opens and Hector and his gunmen run through, there is immediate gunfire. They are shooting at guards and other prisoners. I try to keep my distance and shoot back occasionally to help out, but don’t want to get shot. Soon we make our way into what I would say the prison mess hall and a lot more gunfire erupts. It is at this point that I really need to take cover or get hit with a lot of bullets and risk getting killed. I do struggle at first and you can tell I’m getting shot, but eventually take cover behind a table. I start shooting at the guards on the top level, but I’m also getting hit quite a bit as well. I again take cover and wait until my health replenishes so to speak and then move forward to another area of intense gunfire! There’s also a fire near where more guards are shooting at and Hector mentions for Sam to take cover, but as I try to, someone comes up from behind me and grabs me in a chokehold. I immediately start pressing the triangle button as fast as possible, but then Hector comes by and hits him in the head knocking him off of me. I start to take cover again and then start firing at the guards. I of course am getting hit again as well. Still though I persevere and manage to kill one of the guards. Eventually Hector’s other gunmen kill the other guards and we are able to move along. As I’m moving forward, I grab ammo for the gun I have and also pick up a heavy machine gun or automatic rifle. We then all get into another area and one of his henchmen is talking to another one over radio and Hector mentions to Sam to get behind something. I do that as Sam wonders what is happening. All of a sudden, BOOOOOOOM! There’s a very large explosion as a hole is blasted open in a wall. Hector asks Samuel if he’s alright to which he responds yes. I make my way forward and then finally to what looks like the outside though we’re still in the prison. As you can guess there’s more gunfire as I have to defend myself and shoot back. I do take them out and move ahead finding some more weapons in the process. As I’m going forward trying to catch up, someone drops down behind me, pushes me against a wall and grabs me. I again push triangle, but he is then shot and I can move forward. We then make our way to a stair case and head up them, but guards are there and start shooting at us. We of course fire back and I’m getting hit again, but we manage to kill them. I can now also press the X button while aiming to swap shoulders with the weapon I have out. It is pretty nifty I have to say. We make our way to the top of the stairs and take out more armed guards. All of us then come into what could be a laundry area or some machine area, but once again we come under fire from armed prison guards. 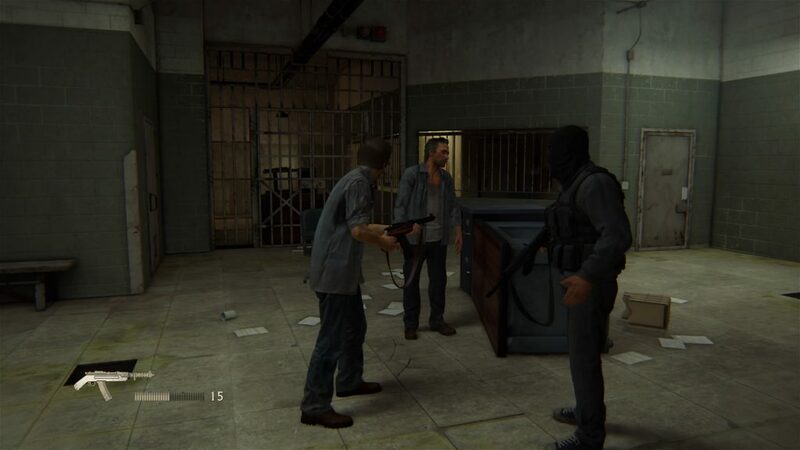 I of course have to take cover and then fire back to try and kill the guards. After all the guards are down, Hector once again tells Sam to take cover as one of his gunmen goes to put an explosive on a door. As soon as he does that, we come under fire yet again from more guards that make their way into our area. I manage to kill most of them and then the door is blasted away and we keep pressing forward. We are then back outside and once we climb over a fence and round a corner, we see that a chunk of the prison is on fire, but then we come under VERY heavy fire ourselves from some very powerful artillery that the remaining guards are using. We try to take cover behind these large concrete blocks and other concrete barriers, but they soon get blasted away from the weaponry that the guards are using. I’m getting hit severely and it seems like I’m about to get killed when all of a sudden there is a large explosion from where the guards and the heavy piece of weaponry were that the guards were using. We soon make our past that area, blast open another door, go down another corridor where we are fired upon and kill more guards. After we climb and then jump over a railing, we are finally outside of the prison and at least 3 vans show up. These are Hector’s getaway vehicles. We all run as fast as we can to the vans while we are being fired upon and Hector’s gunmen fire back. We both get inside and the vans speed away. I must say that was one intense section of the game! I can only imagine that is just but a taste of what’s to come. As we are driving away Hector gives Sam some water and then asks him what he’s going to do next. Sam then mentions he wants to get back to the US and find his brother. Hector then asks him about the treasure and how long it will take for him to find it. Sam says that it is hard to say as there are basically other factors and things he has to do. Hector however is still persistent and wants to know an exact time. This is where I get the feeling things are about to go south and I am right. Hector motions for the van to stop. The driver gets out, slides open the door and throws Sam out. Hector then gets out of the van and mentions that he likes Sam, but is beginning to have doubts as to whether he really knows where this treasure is. Samuel pleads with him that he does, but it will take time to get to it. Hector again asks him how long it will take, but this time with a knife at Sam’s throat. Sam says it will take 6 months, but Hector says that is too much time and instead gives him three months. He also warns that if he attempts to tell the authorities about this, he will come for Sam and death would be a luxury that he would not give him. He then gives Sam a container of water and tells him to walk 10 kilometers towards the sunrise because that is where the next town will be. He also gives Sam some money. As Hector and his gunmen are about to leave, Sam asks him how he will contact him once he finds the treasure. Hector says not to worry as they will come to him. Once that scene is over, the game shifts back to the present and Sam is telling his brother Nathan about all of this. He said he needs Nathan’s help in finding this treasure. Nathan says that it is pretty much a waste of time because another person who originally was with Nathan and Sam has been searching and digging for years to find this treasure and has come up with nothing. Sam then pulls something out of his pocket saying he doesn’t have something that could point him in the right direction. It’s a piece of paper with a picture of a cross/crucifix on it. Nathan says that is the crucifix they found at the prison, but Sam says to take a closer look. He reminds Nathan that the one they found in the prison was broken and hollow, but this one is intact. Nathan is surprised that there are apparently more crucifixes made from this pirate. Sam then says to Nathan that it is going to be auctioned off and he needs his help in stealing it. Nathan initially protests against this saying there are others that can do this, but Sam does not want any others and instead wants Nathan only and reminds him that he does not have a lot of time. Nathan then calls his wife Elena and lies and says he is accepting that Malaysia job after all and will be gone for an undetermined amount of time. Elena seems glad that Nathan is taking the job although of course he really isn’t. The game then goes to the next chapter which is the place where the auction of that crucifix is going to take place. 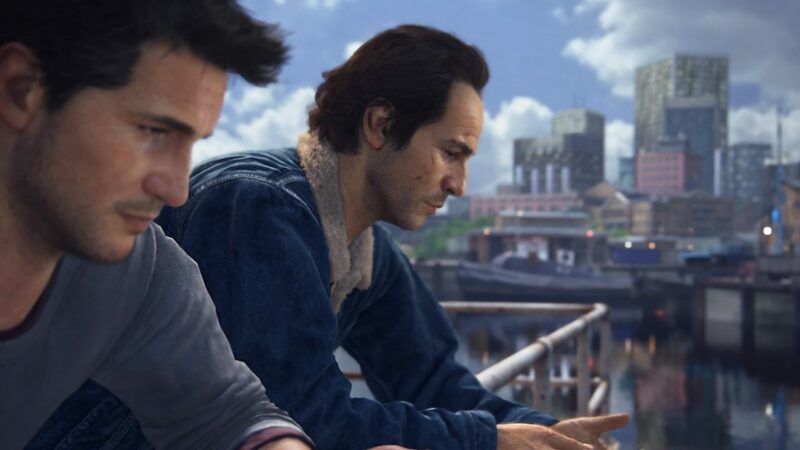 Nathan and Sam are wanting to sneak in, but Nathan mentions that Sully (a character from the last 3 Uncharted games) will pull through for them. Eventually Sully gives the signal that they can now sneak in and this is where I end Part 4. Wow what an interesting part that was! 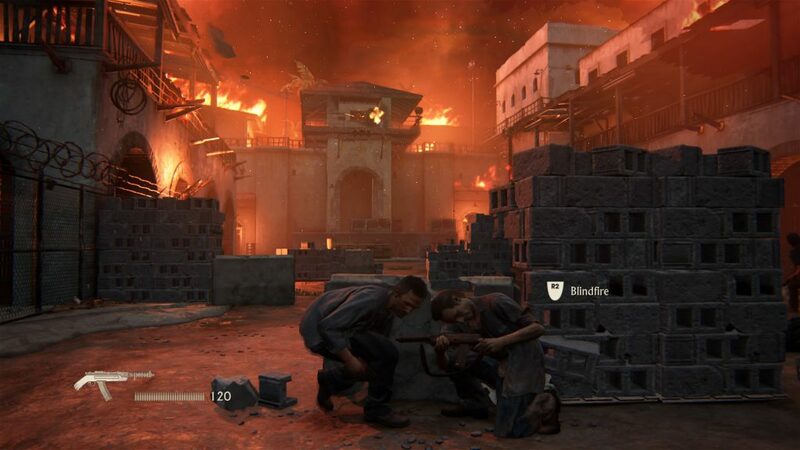 In my Uncharted 4 Part 4 description of the video, we see that Sam is reunited with Nathan, Sam mentions that he is trouble from a drug lord in which we get to see and play why that is, and then Nathan decides to help his brother. Coming up in Part 5 I will talk about how they all sneak into the auction and what they will have to go through in order to get that crucifix and it also sounds like we will get to see the character Sully once again. I hope you enjoyed that and check out the video of Uncharted 4 Part 4 below! This is a really unique way to bring the game to life my Friend. Reading Uncharted Part 4 was amazing and then to watch the gameplay on the video that you posted was so cool as well. Do you play the game while recording then write about your adventure or how do you create it all? I have never seen such an interesting website that I could follow along with as if I were there and then to see it all in video as well was thrilling. Hi there Tony and I’m glad to hear you found my post so thrilling! As far as your question, the answer is yes I do record while I play the game and then write about my experience afterwards. I thought it would bring a unique feel to it so people can read and also see with the video I posted, what I am going through with this brand new game. I definitely have many more planned so if you like what I did there, definitely check back!